Why Quantex is better than other pump designs. The Quantex pump provides a precision alternative to peristaltic, gear and diaphragm pumps. The peristaltic principle of squeezing a flexible tube is fundamentally inaccurate as it is very sensitive to flow rate, up-line and down-line pressure, resilience of the tube, viscosity of the fluid being pumped and the temperature and number of cycles the tube has been subjected to. Accuracy is also affected by how the tube is loaded into the pump driver by the operator. Precision is only achieved by sensing temperature and pressure, knowing the fluid viscosity and physical properties of the tube, counting the number of cycles and then compensating for these variables using software. This leads to a complex and expensive pump driver with numerous failure modes. Furthermore it is difficult to ensure the tube set is compatible with the pump driver. The output is pulsatile with large amplitude from no-flow to maximum flow. Linear peristaltic pumps reduce the amplitude but require a large number of mechanical moving parts which again translates to high manufacturing costs and wearing parts that require routine maintenance and periodic calibration. At least one point on the tube always has to be pinched closed requiring significant force which translates into additional energy consumption not related to fluid flow. When the tube is removed from the driver there is free-flow unless an additional tube clamp mechanism is deployed. Gear pumps typically comprise of two spur gears that accurately mesh together and precisely fit an enclosure containing one-way valves. Dose accuracy is sensitive to inlet and outlet pressure and liquid viscosity. The close manufacturing tolerances required to achieve dose accuracy make it expensive to manufacture and unsuitable for concentrates containing cells or particulates. A membrane is held across a cavity in a moulding that carries a valve. The membrane is flexed mechanically to change the cavity volume. Again volumetric accuracy is dependent on inlet and outlet pressure and the need for a valve makes it unsuitable for fluids carrying particulates. The Quantex pump is based on a rotary, fixed displacement principle thus is much less sensitive to variables such as line pressure, fluid viscosity and flow rate. There is no requirement for any software compensation except at the extremes of operation. The driver is simply a motor that can be programmed with the angular velocity (flow rate) and number of revolutions (dose volume). The pump is attached to the pack of fluid being dispensed or on the pack line and ensures a new pump is presented with every new pack thus zero maintenance and no calibration required. 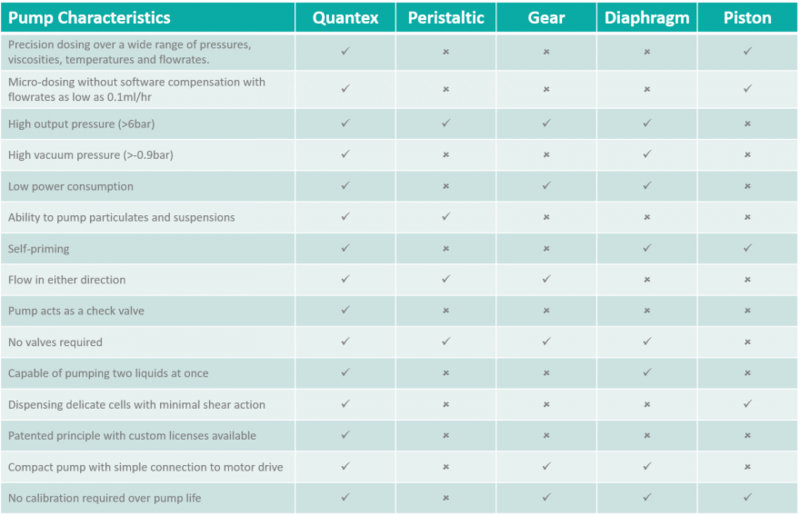 See the table below for the full list of benefits and the Quantex pump brochures for more information.